The Mediterranean coast between Marseille and Cassis impresses with a formidable cliff line and rocky coves - the Massif des Calanques. Bright grey limestone cliffs rise out of the sea and are in stark contrast to the clear, turquois water of the mediterranean. Supposedly one of the most beautiful of these coves is Calanque d'En Vau, which is accessible by a nice hike over limestone gravel and rocks, through mediterranean pine forest and macchia. When we hiked there last spring, the small beach at the base of the Calanque d'En Vau was filled with hikers as well as some climbers - the Calanques are a prime territory for rock climbing. In comparison to a bog-standard shot of the turquoise Calanque waters and the bright rocks, the photograph above is certainly a rather unusual composition. However, for me it is linked to a memorable photo session and quiet observation of the water surface for almost an hour. I have been standing right above the water surface on a limestone ridge. 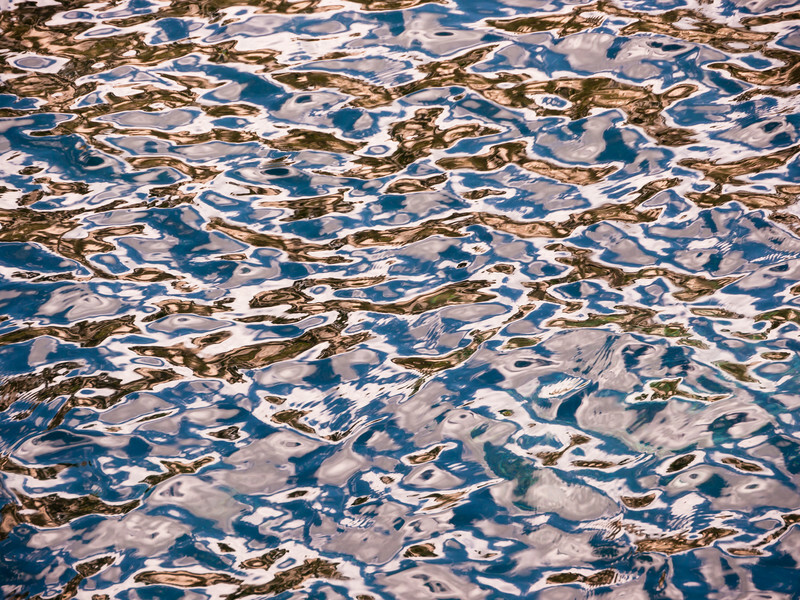 The direction and strength of the wind was changing all the time, sometimes a cloud cast a shadow, and thus the reflected colors and the patterns on the water surface varied constantly. During my watercolor photo session I captured many different compositions. The capture shown above is the first example that I would like to share; more will follow. In the meantime, also have a look at the other watercolor photographs shown so far.